DOES A FREE PRESS STILL EXIST FOR TRUMP TO ATTACK? While I more than share the concerns of Professor Robert Reich and others that find an impending Donald Trump presidency to be a scary prospect, I do not find it productive for Reich to fabricate a fantasy ideal of a supposed free press in the United States, that if the truth were to be told, has not existed long before Trump came on the scene to attack. On today's Democracy Now ex-Secretary of Labor and now Berkeley Professor Robert Reich vilified president elect Trump without ever acknowledging that this country doesn't have a free press. How could Trump threaten a free press that on its own gave him what is estimated as $1 billion in free publicity during the recent election, while openly and knowingly abrogating its responsibility to report the real news, that Reich continues to falsely assume they did. Could it be that when it comes to the real nature of the press, Reich is as truth challenged as he accuses Trump of being? Donald Trump is not turning the public against the media as Reich asserts, rather a corporate dominated press that exclusively reports corporate party line has already done this to itself. Endless wars for the sole purpose of corporate profit have never found it difficult to get the mainstream media's unquestioning support. This reality of the co-option of the 4th Estate took place long before Trump. But it did give Trump an opening to assert- without fear of contradiction by a lied to public- that "the press are liars...they're terrible people." What would you call a press that goes along with wars in Iraq or Afghanistan justified by the known falsehood of "weapons of mass destruction" or by refusing to cover the multiplicity of domestic issues that never seem to see the light of day on an evening news that now cover little of relevance, while having well over 50% of its broadcast time given over to commercial advertisement. If the election results prove anything, it's that the public was already against the media, because it doesn't report the news. Rather, it tells us lies that Bernie Sanders "is not a serious candidate-" much like Donald Trump- and that "all the polls show Hillary Clinton is going to win. Has the mainstream media ever acknowledged its lies? Are these lies any worst than Trump's? At least Trump doesn't believe he's telling the truth and his supporters don't seem to give a damn. In this context, when Trump says, "The press are liars...they're terrible people," is Trump wrong? 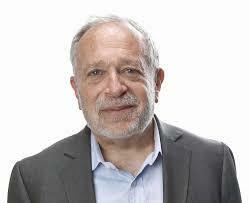 What is the difference in the "fact free universe" that Robert Reich accuses Trump of living in and the fact free universe Reich's idealized media has now created for generations by failing to correct the known falsities that both Democratic and Republicans have engaged in without an independent 4th Estate keeping them honest? If Robert Reich really believes- and I think he does- that "freedom of the press depends on the tacit norms and understandings of a free society," it is incumbent upon him and others in the Democratic party and elsewhere to acknowledge that these norms were abrogated long before Trump was on the scene. And if Robert Reich, Bernie Sanders, or other good people want to see this situation turned around by Our Revolution, we need to clean our own house first as a prerequisite to going after The Donald and the nadir of consciousness he incarnates. ‹ THE REAL COST OF MARGINALIZING THE "ELDERLY"